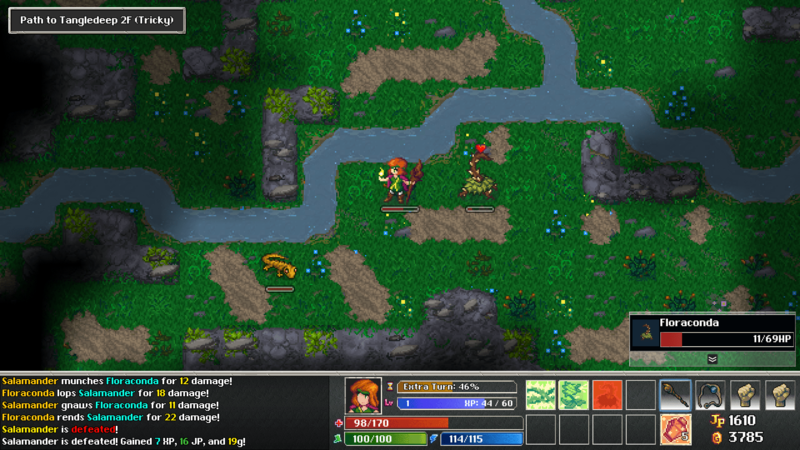 Tangledeep is a love-letter to the 16-bit era rogue-like RPGs of the 1990’s. With twelve playable jobs, hundreds of skills to play, and a gorgeous world of pixel art to explore, Tangledeep is a tough, but worthwhile, gaming experience. I caught up with Andrew Aversa, Tangledeep‘s lead developer, programmer, and musical composer on the cusp of the first expansion to Tangledeep being released: The Legend of Shara. During our time together, we talked about Tangledeep and The Legend of Shara‘s development, the surprising Steam Community controversy around the main character being female, what players can expect in the upcoming expansion, future platforms for Tangledeep, ideas for the second Tangledeep expansion, the next Tangledeep game, and more. This is Part One of a Two Part Interview. You can check out part two on Tuesday, March 19, 2018. 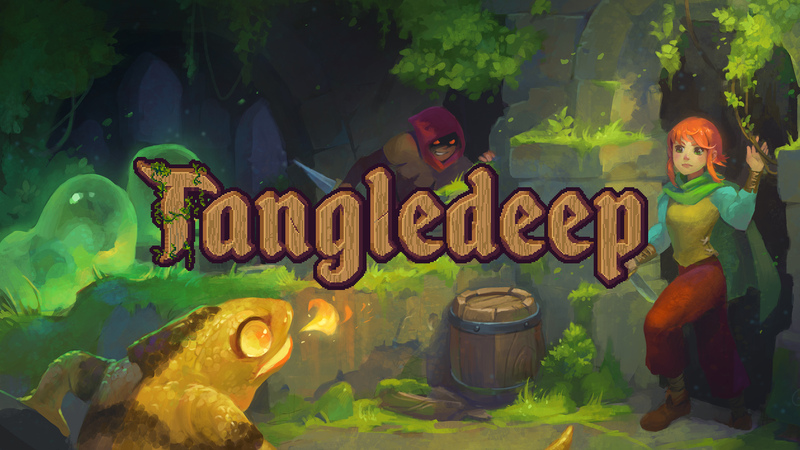 You can find out more about Tangledeep on its official website, on Twitch.tv, on Twitter, and on Discord. You can follow Andrew Aversa on Twitter and at his website. Finally, you can check out Impact Gameworks, the company behind Tangledeep, at their official website. You can also check out our review of Tangledeep here. Tangledeep is out now on Steam, GOG, and the Nintendo e-Shop (NA/EU/AUS/JP). Andrew Aversa: My name is Andrew Aversa, I am the lead developer of Tangledeep. OR: So what is Tangledeep? 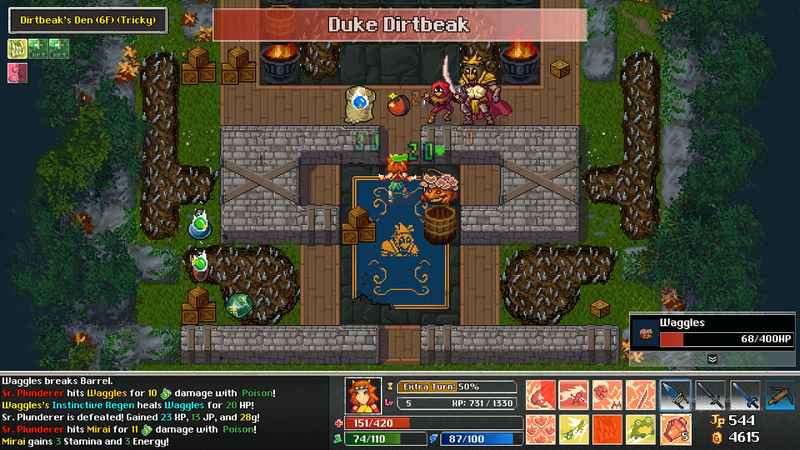 AA: Tangledeep is a 16-bit style dungeon crawling RPG. It’s a rogue-like- which is a term that gets used by a lot of people to mean a lot of different things- but we use it to mean the more distilled rogue-like genre. Meaning, turn-based [and] you take one step at a time. All the monsters move when you do. The default mode is, if your character is defeated – that’s the end of your run. Of course, there’s some options onto that, but the core rogue-like experience is part of the game. And it’s very much modeled aesthetically after Super Nintendo RPGs like Secret of Mana, Chrono Trigger, games like that. Tangledeep is a 16-bit throwback title with thirteen playable jobs, hundreds of skills to shape your gameplay with…and frogs. Lots and lots of frogs. (Image courtesy of Image Gameworks). OR: When you started Tangledeep, you had zero programming experience. You had to teach yourself Unity, C#, and basic developing systems. Why did you choose to take the path of hardest resistance, instead of finding people that had this knowledge and experience already to work with? AA: So, I had a little bit of experience coming into this. It definitely was not C#, Unity. Back in the ancient times of IRC [OR Note: Internet Relay Chat], I used to come up with these chat-based RPG games using very basic scripted language. I really enjoyed doing that. I spent more time writing the ideas for the games then- I guess you can say ‘my eyes were bigger than my stomach’, so to speak. I came up with a lot of ideas for games, things I couldn’t implement. So two years ago, when I decided to give this more time, more attention [and] resources, I couldn’t help myself- I had to go all in. I didn’t want to start with just a basic project and work up to a slightly bigger one and a slightly bigger one. That didn’t seem fulfilling or satisfying. I just wanted to go make something [that] I truly wanted to make. “And I’m – in hindsight, I’m glad that I didn’t end up working with a publisher, because I’m glad I got the final say on everything in the game. OR: You hired people, including OceansAndrew [OR Note: His real name is Andrew Leurs]– who had never done pixel art before for Tangledeep. Why did you delegate the art out? AA: So I personally – I’m not a visual artist. I’ve been a professional musician for about fifteen years. But when it came to visual art, I’ve always been dreadful at it. So my impression, despite not having experienced creating games before- I’ve played many games and I realize that the aesthetic, what you see, is so important to a game’s experience. And I wanted people that shared the same ‘tastes’ in pixel art. So in a way, OceansAndrew- he’s an artist. That’s his background, in graphic design art-even though he’s not a professional pixel artist. He also loves this SNES-era of RPGs. And eventually, when I found a character artist and then an item artist- there are three people working on three different elements of the game- all those people share the same love of that era, which in my opinion is one of the finest art aesthetics in games. If you go back to early polygons, it doesn’t look quite as good anymore, but the pixel art still holds up. So it was important to find people with the right taste. AA: I’d say that it was definitely a case of gameplay coming first. Sort of writing code and coming up with gameplay at the same time. And once I started moving past stock art, and once I started getting those first sprites and seeing the art style [that] the artists came up with- I described the kind of art I was looking for, but I couldn’t sketch anything myself. So once I saw what was coming in, that influenced the world. I figured more of a fantasy world, but not with traditional races like elves and dwarves and Tolkien, Dungeons & Dragons – as much as I like that. So that was step two – is fine tuning the world based upon the gameplay and the art. And then the story was the third element. That was probably the thing that got overall the least development time, but something has to give, inevitably that you spent the least time on. And in this case, it was the story, and I figured that was okay because of the kind of game [Tangledeep] is- a dungeon crawling game. You don’t want to be playing the same exact story with extensive cutscenes a hundred times. OR: Talking about the story- you said that you worked on that the least, right? AA: Yeah, not to say that we didn’t work on it at all, but priority-wise: it was the lowest. 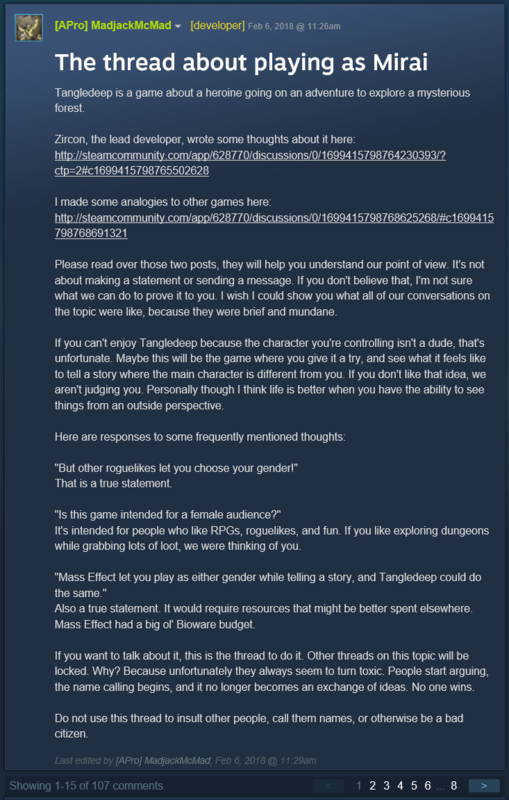 OR: I was reading through the Steam community comments, and there seems to be a decent amount of vitriol about the main character, Mirai, because of her gender. Were you surprised by this response? And then once I realized that the budget wouldn’t allow for the level of animations that we were doing across two different genders, I figured “Well, let’s go with one and that way we can make sure the animations are nice and polished for all of the jobs.” So people kind of took that to mean in all sort of ways. And going into it, people took that as making a bold statement one way or another, when really it was a limitation on resources and we were just making the best of it. The negative comments about Tangledeep’s protagonist being a female prompted a master thread to be posted by the development team about the subject. OR: This game originally came out on Kickstarter. AA: Yeah, this was our first public- it didn’t go on sale first. So Kickstarter was the first way to raise money and then Early Access on Steam after that. OR: Well, your Kickstarter was successful and then you wrote a book about it. You then did nine patches in the first ten days after [Tangledeep] hit Early Access on Steam. And you mentioned on the Discord about how you performed sixty or so patches since you’ve put the game out. How do you do it? How do you balance your work life with your personal life? AA: I think, for me, it is a lot about raw passion for this project and game. When, around that time, we launched it on Steam, that sort of period- even though I’m not working for another publisher/developer [and] I’m working for myself, I was working so hard that I got sick several times. I had all sorts of health problems because it was self-imposed ‘crunch’. And that’s, I think, unfortunately a common thing in the game industry. But in my case, it wasn’t mandated- it was coming from pure passion. Since then, I’ve tried to balance things out. Part of that is because my wife and I started a family. [Part of] having a daughter is that I can’t work for sixteen hours [and that] I have to spend time with family, which I enjoy doing. But part of it, I want to say, passion for the game is also- if I see that there’s a bug that I know I can fix, if I see that there’s a balance problem brought up by an experienced player- I want the game to be the best it can be. It’s not like I’m getting money for every patch I put out, there’s no transactions or anything like that- it’s not a service where people are paying monthly. I just care about making the game better, even though the majority of sales – like most games- come in closer to launch than over time. OR: You mentioned how you went without a publisher. Why did you choose to go that route with releasing Tangledeep? AA: Honestly, I tried to reach out to three different publishers about the game. One of them never got back to me. One of them said ‘No’ very quickly without even reviewing the pitch. And the third one, I got- we went back and forth for a couple of months at GDC and all that. And they said ‘No’. And I think part of that was probably because they looked at somebody who didn’t have any experience developing games as a programmer or designer on paper, and worked on games as a composer. But obviously this was my first [time] as a programmer and designer. So after those rejections, it kind of gave me more motivation to say “Well, if they don’t believe in me, I’m just going to believe in myself even harder.” And I’m – in hindsight, I’m glad that I didn’t end up working with a publisher, because I’m glad I got the final say on everything in the game. I’m glad I’ve been able to do whatever I want with pricing and localization- I have total freedom to do what I want with the game. And obviously, going back to the passion thing: what I want from the game is [it] to be as good as it can be for as many people as possible. There is a lot to love in Tangledeep with its pixel art design, combat system, and more. (Image courtesy of Impact Gameworks). OR: So, this game turned out to be a smash hit – not just in the United States, but in Japan. AA: Yeah, much to my complete shock, it was like having a second [launch]. The Japanese language was not available when we first launched on Steam, so when Japanese came out for the first time- when that localization was launched- it was like the game launched all over again, which was unheard of. Usually that kind of thing never happens. You get your bunch of sales Week One and then it trails off. In this case, when it hit the [Japan] chart, it was a huge spike. And it has continued to do well. OR: What do you think about Tangledeep appeals to a Japanese audience versus an American audience? AA: I think it comes down to two things: one is the presentation of the game. I think there are a lot of Japanese gamers that have the same sort of tastes for that 16-bit style of sprite work and also that kind of music. In the Super Nintendo/Super Famicon-era, there were way more role playing games that never even came to the U.S., it was a genre that was even more popular in Japan than it was in the West. Rogue-like-type games also have a bit more history on consoles in Japan, with the Mystery Dungeon series [and] there’s Shiren: The Wanderer– it’s a whole franchise now. It didn’t really set in as much in the West, and so I think people have responded to that and said [that] they like the presentation, they liked the influences of the games, but it is also reminiscent of that franchise. I only played that in the last few years, I didn’t play it when it first came out, the Shiren and Mystery Dungeon games. But they’re really great and I’m glad to have that comparison drawn.